Maria Sittel: Good afternoon, I am Maria Sittel and this is the annual special programme, “A Conversation with Vladimir Putin Continued”, broadcast live. We all remember how this crisis year began – millions feared poverty, hundreds of thousands worried about getting fired, businesses were pondering future losses, and many people thought the authorities would again leave them in the lurch, just as it happened many times in Russia’s history. Of course, many people lost their jobs, many lost both their savings and their jobs, but the authorities did not try to solve problems at the expense of the people. Instead, they worked painstakingly to pinpoint problems at individual enterprises, forged agreements with business, and helped Russian manufacturers. Where did we succeed and where did we fail? These are the questions we are going to discuss with Vladimir Putin today. Ernest Mackevicius: There are representatives of all the basic sectors of the Russian economy in this audience, and also those who will replace them – the future graduates of Russian universities. Mr Putin talked with a majority of them during his tour of the country. Correspondents of the Vesti television channel are now working in Naberezhnye Chelny, Togliatti, Magnitogorsk and many other cities where the country’s key enterprises are located. And so, we are beginning the annual question and answer session with Vladimir Putin broadcast live by the Russia and Vesti 24 channels. Maria Sittel: Our information collection and processing centre continues to receive questions. We are waiting for your telephone calls and text messages. Call 8-800-200-40-40 free or send free text messages to 0-40-40. You can see the website address, www.moskvaputinu.ru, on your screens. Ernest Mackevicius and I will work today jointly with our colleagues Farida Kurbangaleyeva, Tatyana Remezova and Alexander Khristenko. Vladimir Putin: I would like to remind you that my colleagues and I have always said that the threat was still very big. Unfortunately, countries across the world are fighting terrorism, and terrorists have staged similar attacks in many countries. This country is no exception; it was one of the victims of international terrorism, especially in the mid-1990s and the early 2000s. We have done much to break the backbone of terrorism, but the threat has not been liquidated. We can act effectively. What do we need for this? We need for the whole of society, for each of us, to become aware of the threat that has been stalking us for years. We need to do so in order to be vigilant. And of course, we should take comprehensive preventive measures. However, the question is whether such crimes can be prevented. It is very difficult to do it, especially at infrastructure facilities. Our infrastructure network is sprawling because the country is huge and there are very many infrastructure facilities. But still, we must be effective, and we must take pre-emptive actions. The law-enforcement agencies know what I mean. To be fair, let us bear in mind that the Federal Security Service and the Interior Ministry often succeed. But the [Nevsky Express] tragedy shows that they must work still harder. We must take harsh action against the criminals who commit such terrorist acts, who try to take the people’s lives and to injure people. We are firmly resolved to stop them. Ernest Mackevicius: On the previous occasion, in December 2008, when we were starting our conversation in this very studio, we began with the question: Will we survive the crisis? The economic situation was deteriorating fast. Now, one year later, in December 2009, can we say that yes, we seem to have survived the crisis? Or at least that the worst is behind us? Vladimir Putin: The last thesis is probably more accurate. It can be said with a fair degree of certainty that the peak of the crisis is past, although turbulence in the world economy and, as a consequence, in the Russian economy is still there. It will take time, effort and considerable resources to get out of the crisis. On the whole, however, positive trends are making themselves felt and are clearly manifested. The question you have asked gives me an opportunity to say a couple of words about the results of our work over the past year. I think this audience and the people in the places where you have your correspondents – which, by the way, are the regions and enterprises that my colleagues and I visited during the year, some of them more than once, that is, these are problem enterprises and problem spots in the country which had attracted particular attention and called for a quick response to the events that were happening there. Today we will probably discuss a wide range of problems and concrete enterprises and see what has been done there since the time we visited these enterprises. That will give us a chance to discuss the country’s problems as a whole. Going back to your question about what has stuck in memory and what has been done during this difficult year, I would say, first, that it was one of the most difficult years in the past decade – not only for us, but for the world economy in general. These events have hit us hard. We had predicted (though no official forecasts were made), some experts believed that GDP in Russia would drop by about 10 percent. It has dropped significantly, but not as much as some experts had thought. It is likely to be 8.5-8.7 percent. That is a lot. Industrial output has dropped by more than 10 percent. At the end of the year it will probably be 13 percent. At the same time in the sectors that the Government considers to be its direct sphere of responsibility the situation is more or less acceptable. For instance, industry, as I said, is expected to contract by 13 percent, but the defence industry will grow by 3.7 percent. And in some areas, for example in aerospace, they have many problems too and we were recently looking at this industry – but they have a growth of 13 percent. I mentioned the slump in industry, but agriculture, which some in the previous years called “the black hole” of the economy and so on, is a growth area today. It will grow by 0.5 percent this year, and in some areas, for example, in livestock, it will grow by 10 percent. It should have been still greater, but that is how it looks on paper: Last year we had a record grain crop of 108 million metric tons. This year it will be large too, at 93 million tons, but because it is less than last year, on paper the indicators have gone down. But on the whole, I repeat, agriculture will grow by 0.5 percent. We are restoring our gold and currency reserves. Today they are the third largest in the world after the People’s Republic of China and Japan and amount to $444 billion. We have a trade surplus, and we will probably have the best indicator in this area. We have a positive trade balance, probably the best figure. We did well in 2006, and the inflation rate is likely to be lower this year. It will be lower than 10 percent this year, probably even one-digit figure, around 9 percent. This means that we have coped with these problems. You want to know how this has affected the social sphere? As analysts say, the influence was multidirectional. Unfortunately, we see the average wage falling; it is down 3.6 percent. Why? Because the fall in the commercial sector was considerable, 5.6 percent, I think. The influence on the public sector became evident in 2009 because the wage fund in the sector was increased in December 2008, and so wages in that sector increased by 4.1 percent. We have increased pensions considerably, by 13-14 percent. This will explain the result: People’s real disposable incomes have decreased by only 0.4 percent, which is almost nothing. This is a rough average estimate, but still, we have preserved the average real disposable wage. I think this situation can be compared to similar events in the economy in 1998, which were really tragic. I have said here that inflation will be small, around 9 percent, this year, but back then it soared to 84% and people lost nearly all their savings. Banks filed for bankruptcy, all large banks closed and people’s savings vanished with them. You remember Oneximbank and Incombank. Where are they now? Ernest Mackevicius: It was like a domino effect. Vladimir Putin : They simply fell apart. But this time, during the current crisis this year, we prevented that tragedy. We have preserved the banking system, which is still effective. It has its problems, and you may have more questions, but we will return to this issue later. Speaking about the social sphere, I have told you that wages and incomes have remained almost the same as in 2008, which was a very good year. Even though wages in the commercial sector have fallen, wages in the public sector have grown slightly, and real pensions have been raised. You know, I think demography is a very good indicator. I would like to say it again, that we said we thought we would never cope with demographic problems. In 2008, the onset of the current crisis, the birth rate fell by 5.5 percent and mortality reached 8 percent. But look at what is happening now: the birth rate is growing at a record pace – it has increased by 3.5 percent – while mortality is falling. These figures speak volumes, in particular about people’s mood. Ernest Mackevicius: There is hope that is growing into belief. Vladimir Putin : It means that the so-called planning horizons are expanding. People believe in the positive future of the country. This mood is one of the most important elements in the current situation. It is a pure economic factor, because this mood supports demand. By the way, demand has started growing. This is what I wanted to say about this year’s results. Ernest Mackevicius: Mr. Putin, when we, when people will see that the economy is recuperating, that we have overcome the crisis? Vladimir Putin: The economy has been growing in the past five months. The growth is modest, an average of 0.5 percent a month, and some months even lower, 0.3 percent. Some months the economy grew by 0.8 percent, but on average the economy has been growing by 0.5 percent for the past five months. I very much hope that these positive figures will grow by the middle of next year, although we will still feel the effects of the economic skid in the first and second quarters of 2010. Ernest Mackevicius: Pikalyovo, a small town in the Leningrad Region, has become a symbol of the economic crisis this year. I would like, as the anchor of this programme today, to start a videoconference with the Leningrad Region, where Yevgeny Rozhkov, our special correspondent, is working today. Pikalyovo, you are on air. Yevgeny Rozhkov: Good afternoon, this is Pikalyovo, a town with a population of 20,000 located some 250 km (155 miles) from St Petersburg. Few people had heard of it until last spring events hit the town, , and especially after you, Mr. Putin, came here to resolve the problems of this single-industry town. Mr Prime Minister, you know what happened then, and you know the current state of affairs. I will update the audience in a few words. There was one strategic enterprise in the city before 2004, after which it was divided into three units, with their separate owners. As you know, owners do not always agree, and the lack of coordination between them hit the town last spring. This is when you came here. During the few days we have been in Pikalyovo, local people told me that the mood now is approximately the same as it was then, that there is similar uncertainty. Standing here, at the gates of this plant, are representatives of the three plants that once were a single enterprise and also their top managers. So, we are ready to begin a long, serious and comprehensive discussion. I suggest that we start taking questions. Those who have questions should raise their hand. Let us begin with you. Please, introduce yourself before asking your question. D. Nikolayev: Mr Putin, you visited us in June and solved our problem using an individual approach, in the manual mode, so to speak. Six months have passed since then. Our companies have failed to sign contracts during this time period. We do not know what to do. We are unable to objectively plan production or specific prospects. We are working and living only from day to day. Mr Putin, what are we to do? Should we invite you once again to resolve this situation and our problems? Vladimir Putin: I will visit you and any other place in the Russian Federation if the situation so requires, it’s my duty. But in my opinion, there is no need for this. Naturally, signing contracts with raw-materials suppliers is the most important task today. It is important that they launch a normal production process. Moreover, we are constantly monitoring the situation in one-company towns, including Pikalyovo. I have instructed one of my deputies to establish an ad hoc working group on one-company towns. We are monitoring these processes at expert level, at the level of regional administrations and at government level. Speaking of Pikalyovo, it is important that a long-term contract for the entire 2010 period be signed. You are absolutely right. According to my information, all the parties to the process will sign such a contract in the near future. I think that all company workers will breathe a sigh of relief after this happens. Everybody will then realise that the enterprise is going to work smoothly. It appears that the state should not be involved in this process at government level all the time. We must look for other more fundamental and common solutions. At any rate, such solutions should be found for this industry. Can they be found? It is hard to find them because, as I see it, we had been imprudent during the privatisation drive and split the production complex into three parts, which are now having a very hard time cooperating with each other. Nevertheless, a common solution can be found. What is the essence of this solution? We are now tackling the issue of processing casing-head gas. The same can be done with your enterprise’s feedstock. The extent of processing the so-called apatite concentrate produced by your feedstock suppliers is not being regulated in any way. If we introduce a regulation ordering the concerned parties to process 90% or more of this concentrate, then enterprise owners would be unable to just throw it away and would have to find processing enterprises. This also applies to your enterprise. This will harmonise relations. I hope this will happen in the near future. I also know that there are plans to build other enterprises that could supply feedstock for the Pikalyovo works. Ernest Mackevicius: Mr. Putin, why did you decide to go to Pikalyovo at that time? Were you not afraid that this would create a certain precedent and that you would subsequently have to travel all over the country and “put out fires” and defuse tensions everywhere, instead of running the government? Vladimir Putin: We must recall the attitude in society at that time. The fears about the economy were very real, especially in one-company towns. Although there is a multitude of challenges today, the problems were extremely acute at that time. I got the feeling that far from all regional, municipal and government leaders perceived the acute nature of those problems. I thought it correct and appropriate to send a message to society and leaders of all levels and to tell them that they would be held accountable for all local developments. True, the problems had evolved over decades. However, we are now responsible for the situation, for people’s lives and their financial security, as well as their mental and emotional state. It would therefore be very imprudent to pretend that we know and understand everything, and that the problem will resolve itself. I must tell you that, although many of my colleagues tried to dissuade me from going there for precisely the reasons you named, I decided after the trip that this must be done in order to persuade all the parties to the process to take part in effective joint work. On the whole, this approach has proved successful. Ernest Mackevicius: Let’s get another link-up with Pikalyovo. Yevgeny, go ahead, please. Yevgeny Rozhkov: Naturally, we still have many questions here. Who wants to ask another question? Tatiana Gulina: I have a question about one-company towns. I live in a small town, where all social services used to operatenormally. But now the local technical school has been shut down, and so were the infectious diseases department at a community hospital and the maternity department. The town has no local tax authority, the Pension Fund office has been closed, and there are rumours that the hospital will be shut down as well. We are not far from the railway, and have a railway station, but trains do not stop there, running from Tikhvin to Vyazimovskaya. Bus service from both of these stations is not very reliable. Buses run at very long intervals. How are we to travel to and from the town? We are being forced out. What are we to do? How do we survive? Thank you. Vladimir Putin: Tatiana Anatolyevna, I have just cited plans to sign a long-term contract for 2010. I also mentioned other policies the government can adopt to ensure stable operation of your company, your town’s principle employer, the Pikalyovo cement plant. Therefore, I think the most burning economic problems, such as unemployment, will be resolved; further on, I believe there is a need to diversify the economy at places like Pikalyovo, and to improve local social services. As regards the social problems you mentioned, let me repeat that there has been some improvement in the housing situation, which is entirely due to the close attention we are giving to this issue. Housing and utilities are being repaired, and local roads are as well. I don’t know if you have noticed. I can tell you what I know from reports, and then you can tell me if this is really so from what you know. A swimming pool is under construction, and so are other leisure and entertainment facilities. However, there are problems here, too. Tatiana Anatolyevna, you certainly realise that all problems cannot be resolved from Moscow. However, what you have said will be another reason for me to talk with your governor and ask him to submit regional and municipal governments’ plans for Pikalyovo development. I believe living standards will gradually improve. Ernest Mackevicius: I see a hand from my colleague, Tatiana Remezova: We have questions from the audience related to this issue. Go ahead, please. Tatiana Remezova: Thank you Ernest. Passions are truly running high in the audience. We can see that the Pikalyovo developments involve everyone. This row here is taken almost entirely by representatives of St Petersburg Izhorskiye Zavody. I see that Alexander here, a foreman at the plant, is eager to speak. Go ahead, Alexander. Alexander Stepannikov: Mr Putin, we met last June, when you visited the plant. You were standing right near our machine tools and could see the giant metal components we made. You also attended the launch of the DSP-120 steel smelter, which is a unique facility. Unfortunately, it is now only used to 30% of its capacity, because there are no new orders from nuclear power plants. We have rising concerns that we could end up in the same situation as Pikalyovo. We would like to hear what measures are being taken in such situations across the country? In fact, what we do not understand about Pikalyovo is that if those who are to blame for the crisis have been found, why aren’t they in jail? Vladimir Putin: About punishment –no criminal charges have been brought against them. The problems in Pikalyovo are purely economic, and many issues have not been resolved. It is hard to blame the problem on a specific individual. If we send everyone to jail, who is going to carry on with the work? What we need to do is not intimidate or jail someone, but organise a stable business process, so that all of the participants – three in this case – and suppliers, too, can function in harmony and without loss. This holds true for any company. If we support Pikalyovo too much, we could hurt, for example, the company that mines apatite. That company should also be kept afloat, for the sake of people who work there. Therefore, our goal was not to arrest and punish. We concentrated on restoring a regular production process and resolving the town’s social issues. About Izhorskiye Zavody – it is our biggest plant with longstanding traditions. Power engineering is an extremely important sector of the economy. We have grand plans for the development of nuclear power generation. Whereas during the Soviet years, a mere 35-38 major nuclear power generating units were built, we plan to build 30-32 over the next decade. This is a colossal project. The Rosatom state corporation has enough funds, and we have provided additional support. The only issue here is whether your products will be competitive. I am aware of the discussion underway between your company owners and shareholders, and the Rosatom management. It is about the price of your products and other factors which make the products competitive. Our sympathies certainly lie with you. And it also means something. It means that you will have a job. Although the situation is challenging in the economy in general and at your plant, I am confident that the Izhora plant will overcome the difficulties. Ernest Mackevicius: Thank you, Mr Prime Minister. Now Pikalyovo, please. I can see there are people where my colleague Farida Kurbangaleyeva is working who want to join our conversation. Farida, go ahead please. Farida Kurbangaleyeva: Yes, we’ve got a question. I would like to introduce Galina Churikova, who has worked for 50 years at the Khrunichev Centre, Russia’s leading space research and production company. She started there at 15 and has been working there up to now. In March Ms Churikova talked with Prime Minister Putin when he visited the plant, and asked him a straightforward question about pensions. She has another pending question, I believe. Go ahead, please. Galina Churikova: When you visited our facility, I asked you why work record is not taken into account when pension rates are calculated. It doesn’t matter if a person has worked for 5-10 years or for 50 years, the pension is the same. Some time has passed since then, and despite what you call certain economic difficulties, you found an opportunity to raise pensions. Starting from January 1, 2010 pensions will be increased by 1 percent for every year of employment up to 1991. Plus, there is a 10 percent increment, if I’m not mistaken. 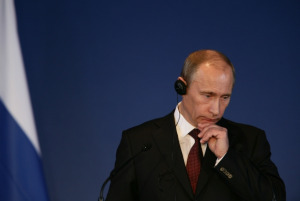 Vladimir Putin: 10 percent in total and 1% for each year of employment. Galina Churikova: In my case it’s 37 years, so I’ll get a 47 percent increment. We, pensioners, are grateful to you for this. It’s a great help for us. Thank you for listening to the opinion of ordinary workers. This is my question today: Newspapers and magazines have been mentioning the word valorisation a lot. What is it? Pensioners and even young people do not understand it. Could you explain it briefly, please? Vladimir Putin: Ms Churikova, you have described the essence of valorisation very well, so I have nothing to add. Valorisation is conversion of pension privileges that people earned in the Soviet time: A 10 percent increment is paid immediately and 1 percent is paid for every year of employment. That is all. Galina Churikova: Thank you very much. Ernest Mackevicius: Mr Prime Minister, there is another common problem that has been raised by our callers. There are a lot of questions on maternity capital. People wonder whether they can use this money to repair houses, pay off bank loans, etc. For example, Irina Tsvetkova from Omsk asks whether a law can be introduced that would allow using maternity capitals for the treatment and rehabilitation of children with disabilities. There is another question, from Maria Zhityayeva from the Samara Region. “Why can’t I use the maternity capital to repair a private house?” she asks. And one more question, “Why can’t it be used to pay off a mortgage loan?” There are a lot more similar questions on this topic. Vladimir Putin: When we made the decision to provide support to families with two or more children, we called the project maternity capital. We proceeded from the assumption that it is necessary to support women who bear the heaviest burden if the second child or several children are born into their family. Experts believed at that time – and their opinion remains unchanged – that these funds must be employed in addressing the most acute problems of the present day. These problems include housing, bringing up children, education, and, if we speak about supporting women, their future pension rights, hence the outlined directions of using maternity capitals. This money can be used to improve housing conditions, but it’s clear that this sum is not enough to buy a flat in Moscow or St Petersburg. By the way, the maternity capital rate is indexed annually. When introduced, it was 250,000 roubles, and has reached 311,000 or 317,000 roubles now, I don’t remember. It will be indexed every year, as we pledged. If a woman wants, she can deposit the whole amount in her funded pension account. A family or a mother may decide to spend it on education. I guess we’ll touch on education today as well. We’re setting a critical task for ourselves to change the profile of the economy and to make a transition to high-tech development, which requires educated, skilled personnel. I know how much care our society gives to children, thinking about their future and education. We came to a conclusion based on calculations that the maternity capital can be spent on education and housing. These funds can become part of the family capital, be saved up or spent on a mortgage. We made this decision early this year resolving that women and their families would be able to use this money earlier than planned, namely before January 1, 2010. We authorised the use of this money in 2009 because of the economic downturn, when many people faced problems, such as redundancy or pay cuts. In this case a family could withdraw the maternity capital to repay the mortgage. The list of possible options for the use of maternity capital may be extended further. Why haven’t we done it yet? Only in order to secure women’s interests. It’s easy to withdraw this money. 317,000 roubles is a considerable sum for people in the regions. It will simply vanish overnight. It won’t be spent on education, housing or to replenish pension account funds. What can I say? There is never enough money. As for repairs, I am not going to make any negative comments about construction workers but we all know their pricing policies. All that will be left from maternity capital will be dust. As for the opportunity to spend this money on healthcare and a child’s treatment, we could consider this issue. We’ll discuss it with MPs, who actively participate in these efforts. Ernest Mackevicius: And mortgages as well? Ernest Mackevicius: Mr Putin, one more tragedy that hit us this year was the dam accident at the Sayano-Shushenskaya Hydroelectric Power Plant. When you were there, you said: “We will rebuild the equipment, but the people cannot be brought back.” In fact, you expressed the feelings of all people, because everyone felt the pain of the tragedy in Siberia as their own. We are connected to the engine room of the Sayano-Shushenskaya power plant in village of Cheryomushki, Khakassia, where our special correspondent Pavel Zarubin is working now. Good afternoon, Pavel, we are waiting for your questions. Pavel Zarubin: Good afternoon, Moscow. We are standing in the engine room of the Sayano-Shushenskaya power plant, the location of the biggest man-induced catastrophe in the history of modern Russia. This equipment near us here is the second unit where the accident began. Investigators are still trying to get to the root causes of the tragedy, but this unit weighing a thousand tonnes will be cut up and removed from the plant. Our film crew worked here in the first days after the catastrophe. Today, three months later, we see that the situation has changed radically. The reconstruction of the roof of the engine hall is almost complete, and the fifth and sixth units are ready to be restarted. Repairs on the sixth hydropower unit are nearing completion, and it will be restarted soon. The fifth unit will follow suit not long afterward. Within the next several years, the plant will receive brand-new power units, and the plant will again operate at capacity. Reconstruction work at the plant is still under way, even now, but some people found the time to come here, and I suggest that we talk with them. Please, does anyone have a question for the Prime Minister? Let’s move over here because there are so many people. Alexander Chainikov: Good afternoon, Mr Putin. I am one of those who are rebuilding the Sayano-Shushenskaya power plant. I think everyone in the country knows about the tragedy that happened here on August 17. You saw it with your own eyes because you have been here. This brings me to my question: Do you think the ongoing reform of the Russian power industry is yielding the desired results? We continue to use the equipment and technology our fathers used. The company now has new directors, but I don’t think everything depends on management. I would like to know when the big infrastructure projects in the power industry, which we have been promised and which have been promoted, will begin. Vladimir Putin: When we planned the reform, its authors proceeded from the assumption that the privatisation of some assets would earn the funds needed to expand and modernise our generating capacity. This reform has been given to the new owners. I agree with Alexander, I fully share his concern and his belief that the new shareholders must honour their commitments. They were granted certain privileges during the [privatisation] process, and they made certain commitments. Now is the time to honour them. These promises, these commitments are sealed in documents. You know that we are living through a crisis. The economy has contracted and for objective reasons, and the demand for energy, including electricity, has decreased accordingly. Some people now say that it will be inexpedient to invest the funds promised by the new owners into the power industry. If we do, they say, we will have an overproduction crisis on our hands. I do not think these arguments are substantiated, given the speed of recuperation in the Russian economy and the global economy. We must not delay the development of power generation. We must implement our plans in the sector so that the Russian economy has enough electricity when it enters the revival period. At the same time, we are also discussing the problem with the new shareholders. I assure you that the plans to develop our power facilities, and these are big plans, will be implemented. In the past ten years, we commissioned 13000 MW of capacity, but we plan to commission 10000 MW of capacity within the next two years. These are challenging plans, and they also concern the Boguchany hydroelectric power plant located nearby, in Siberia. By the way, these plans would have been implemented by now had we acted in the same way we did in previous decades. But we now pay more attention to environmental protection, studying the problem of forests [that could be flooded by new plants], completing archaeological projects, and the like. Anyway, we will fulfil the plans we have for this power plant. I repeat that this is a challenging goal, but I am confident that we will attain it. Ernest Mackevicius: We have questions regarding this problem in the audience. Alexander Khristenko, you have the floor. Alexander Khristenko: Mr Putin, there are people in this hall who were among the first to reach the disaster area – the relief team and divers. They saved people from the flooded engine room, which was hell. One of them was Alexander Barkovsky, who saved two people. He has a question; we have discussed this. Alexander Barkovsky: I am Alexander Barkovsky, a member of the South Siberian search and rescue team. I may be repeating what other people have said here, but this is what I would like to know. The new owners of potentially hazardous enterprises like the profits but think little about the safety of their facilities. What can we do to make them change their mind? Vladimir Putin: Yes, this is something we can and must do, and we will work jointly with your department. As a professional, you certainly know that we conduct inspections at all power facilities, carefully analysing the situation at all hydroelectric power plants and preparing recommendations. But this is not enough. We must also think about controlling compliance with technical regulations and the maintenance of equipment. We should adopt a decision requiring manufacturers to monitor the operation of their equipment throughout its service life, including repairs and technical maintenance. This is first. Second, the systems operator has a department that compiles data about technical regulations and repairs. We have proposed expanding its functions to include equipment control. Certain proposals to this effect have been made, and we will consider them. I am not prepared today to formulate the proposals, but the technical safety authority, Rostekhnadzor, will also be updated accordingly. Ernest Mackevicius: Let us hear what people at the Sayano-Shushenskaya plant have to say. Our correspondent Pavel Zarubin is working there. Pavel, we are waiting for your questions. Pavel Zarubin: The workers of the plant who survived the accident certainly have many questions. Who wants to ask a question? Question: Good afternoon, Mr Putin. I am Yelena, the wife of Andrei Malik, who worked and died in the turbine room. I have two children. There are many, very many other widows with children. I am speaking on behalf of the families of the diseased. After the accident, we were issued financial assistance from the state and from RusHydro, the main owner of the plant. But we still have some unanswered questions. We have been given temporary employment at the plant until December 31 this year. Even if we are not fired now, who will guarante that we will not lose our jobs next year or after the complete reconstruction of the Sayano-Shushenskaya plant? And here is another question that is worrying us. We receive a monthly allowance in the amount of the breadwinner’s wage, but the sum is three times smaller than the wage our husbands brought home. Why? And one more question. We have been promised that our children would receive a higher professional education. Where and how can we get these guarantees? Will it be a certificate, or some other document? And the last question. We have forwarded to Parliament’s Federation Council a letter listing our proposals and requests, I think it was on October 29. But we have not received any answer to this day. Can you help us? We hope very much that you will. Thank you. Vladimir Putin: Please, accept my condolences once again. They, of course, cannot make right everything that went wrong during that tragedy. I am sorry. But now we should think about the future. You have put all these questions well. About monthly benefits, payments. Of course they are always lower than the real wages. We might see what can be done to regulate these payments to bring them up, to make these payments more regular, etc., if there are any problems there. But the key question that worries you, and apparently the other workers at the station as well, is what will happen to their jobs in 2010 and the following years, and after the station has been restored. I can tell you right off that a decision has been taken at government level and at the level of RusHydro, in which the government holds the controlling stake, that all the station workers from the families of those who died or are missing, and in general all the station workers who have been affected will get preferential treatment in terms of jobs for the whole period of its recontrction, as well as after the station has been restored, and you should have no doubts on that score. Now for assistance to children. We keep these issues under constant review, of course. As far as I know, 11 children from the families of the dead or missing already study free of charge at educational institutions and several more, two or three, I believe, continue their studies at fee-paying institutions, but RusHydro pays their tuition fees. Assistance has also been given in preparing children for school. There’s no need to worry about that: All the wishes concerning the children’s education have been taken note of, and more, we are doing everything to fulfil them with a minimum of red tape. Ernest Mackevicius: Thank you, Mr Putin. Thank you, Khakassia. Vladimir Putin: Oh, and I haven’t answered the question about the letter to the Federation Council. Frankly, I don’t know about it, but I will talk with the Federation Council leadership and there will be a response. Ernest Mackevicius: Thank you, we are moving on. 8-800-200-40-40 is the number of the “Conversation with Vladimir Putin” studio. And the calls are being taken and processed by my colleague Maria Sittel. Over to you, Maria. Maria Sittel: Yes, thank you, Ernest. Actually things are pretty hectic here, I think our operators will only get a breather after the programme is over because from the moment we went on the air we have been working at peak load. Just to give you an idea: 351 people are trying to get through to our information clearing centre in any one minute. I’ll give you rounded figures so as not to confuse you: As we went on the air we had received 1,550,000 messages and calls, SMS messages and e-mails to our website, but now I can give you the exact number of the phone calls we have had: 1,167,844. The operators have their job cut out. We have someone on the line. The City of Moscow. Hello, you are on the air. If you hear us go ahead with your question. Question: Good afternoon. My name is Yuri. Belarusian President Alexander Lukashenko has been very critical of you recently. But you have not responded. Why? Vladimir Putin: Maybe it’s a sign of love? But seriously, we have also very affectionate and warm feelings for all the Belarusian people, the whole country and its leadership. Of course, the Belarusian leadership would like to get more from the relationship with us. But let me remind you that the year before last we granted Belarus a 1.5 billion dollar loan, last year, 1 billion dollars and this year half a billion dollars. In addition, Gazprom has paid 650 million dollars, which adds up to more than a billion dollars from Russia. If you take the agricultural products market, meat, for example, Belarus exports almost 100% of its meat to the Russian market, and about 80% of its dairy products. They export large quantities of agricultural machinery to this country. Energy. We sell oil to Belarus at reduced duty rates. Belarus has the lowest domestic price in the world, apart from Russia itself; it has the lowest price in the CIS too. There are other areas of our cooperation, especially in the social services, which we set great store by. But, as I said, the Belarusian leadership would like to have more. Perhaps this is possible, but I am convinced that it should be synchronised with the integration processes within the Union State. The deeper the integration, the more opportunities there will be to adopt domestic Russian prices and standards regarding energy. The Belarusian colleagues have again asked us to preserve this year’s prices for next year although the price should be raised a little under the contract signed in advance. The price rise is to be minimal, but it will still be a bit higher. The same holds for loans. In the opinion of our experts, the amount of our loans is sufficient. Especially if you bear in mind that Belarus gets assistance from the IMF (the International Monetary Fund), to which Russia also contributes and always urges the IMF to make sure that a fair amount of that money is used to support our next-door neighbours and allies. There are also problems with agricultural machinery. In effect we subsidise the purchase of domestically made machinery by our farmers. There are no restrictions on Belarusian machinery entering our market, but for now, considering the crisis in our own and world economies, we are not prepared to allow Belarusian producers to join our programmes of subsidised purchases of machinery. Otherwise our own factories would come to a standstill. All these are current problems and they may give rise to some frictions. But on the whole the Belarusian leadership and the President of Belarus are in favour of integration, of closer relations with Russia and we set great store by that. We have recently observed a spectacular manifestation of these sentiments and this policy when Russia, Belarus and Kazakhstan signed documents to create a Customs Union. It is an important move towards integration, perhaps one of the most important in the post-Soviet times because it is a truly a path towards real integration. We very much hope that these processes with Kazakhstan and with Belarus will develop rapidly and will yield a tangible result not only for economic agents because the market is being greatly expanded, various administrative barriers are being brought down, but it will make a difference to the actual lives of our people. As I said, we have done much in the social sphere; we have free movement of people. We have very similar standards in the sphere of employment and so on. We appreciate all this. We will continue to move in this direction together with our Belarusian friends. Maria Sittel: Let us have one more question from a member of our audience. We have Krasnoyarsk on the line. You are on the air, you can ask your question. Question: Good afternoon. My name is Yekaterin Nikolayevna, and I am a pensioner. I am worried about the pay of our preschool staff. An assistant teacher (nanny) has as many as 30 children in her group. It’s a lot of work and responsibility because she is in charge of children. Her take-home pay is 3,800 roubles. She has to pay for her fare, clothing, utility rates, and medicines. What is left for food? Question: How can one survive on 3,800 roubles a month? When will the government tackle poverty among the working population? Vladimir Putin: Yekaterina Nikolayevna, it is hard and, indeed, practically impossible to survive on such pay. I am sure you are helping your relatives and you solve your financial problems together. It is hard, I agree. The question is, what to do. I have already mentioned that we passed a decision at the end of last year, in December, to increase the wage fund for the federal public sector workers by 30% at once, but we immediately launched a reform of the budget sector. I will tell you in a nutshell what these reforms amount to. We have given public sector institutions much greater discretion as to how they spend government money and have enabled them to optimise their spending. In other words, optimisation of expenditure is to a large extent in the hands of the managers of various institutions. The Russian regions have done the same with regard to their public sector institutions, and preschools and other childcare institutions are under the jurisdiction of the municipalities and partly the regions of the Federation considering the special budget relationships between the regions and the municipalities. Where this has been accomplished, it is obvious – we have objective data – that the remuneration of the employees of these institutions is growing. If I heard right, you are from Krasnoyarsk. Krasnoyarsk has a young and energetic governor. I will make a point of discussing this problem with him. If this has not been done in Krasnoyarsk yet, it is time to begin. Ernest Mackevicius: Maria, do you have any more calls? Maria Sittel: We have a lot of calls. I would like to ask Mr Putin for a favour. When we were preparing for this programme we got feedback from some of the more active members of the TV audience, choosing the most interesting and pressing issues. Would it be possible to call them back? We have promised some people that we would call them back as the link-up goes on. Can we call them back? If you could join us in a minute or so, we will try to reach them by phone. While they are trying to reach them, here is a question that came to our message processing centre from Nadezhda Lobkinafrom Angarsk, Irkutsk Region: “I am a diabetic, and I haven’t been able to get subsidised drugs for a year. They issue prescriptions at the polyclinic, but the pharmacy does not have free drugs.” Mr Putin, we have received hundreds of such complaints. Vladimir Putin: I’ll tell you what the crux of the problem is. Until several years ago we did not have any free drugs. We expanded that list and we were confronted with the problem you have referred to. There is only one way to solve this problem: to increase the range of free drugs and provide timely funding. Another problem is the rising prices of drugs. But I understand that this is not what you are talking about. Ernest Mackevicius: It’s the Irkutsk Region, the city of Angarsk. Vladimir Putin: We will take a closer look at what is happening in the Irkutsk Region, in particular in Angarsk. I promise. Ernest Mackevicius: All right. Just to remind you, Maria Sittel is trying to reach a TV viewer who would like to address the prime minister personally. Have you reached him? Maria Sittel: Yes, Rostov-on-Don is on the line. Oleg, Vassilyevich, you can ask your question. Oleg Trusov: Good afternoon, Mr Putin. My aunt Nina is 84 and lives in Azov. She is a war veteran and she is disabled. We recently got a reply that flats will be made available only to those who joined the waiting list before March 2005. Is there a chance for my aunt Nina to get a flat? After all, she is an old woman and these visits that get her nowhere are bad for her nerves. Vladimir Putin: Is your mother a World War II veteran? Oleg Trusov: No, it’s my aunt, my mother’s elder sister. Vladimir Putin: And she is a World War II veteran? Vladimir Putin: The decision has been made and it is final: All the World War II veterans are to be given flats regardless of whether or not they joined the waiting list before March 1, 2005. We are financing this out of the budget for 2010. I have just one question or request for the veterans and the administrative bodies: determine as quickly as possible the number of people who are entitled to new housing under that decision. This needs to be done so that our construction companies could get government financing in time to buy or build the required amount of housing in 2010. As for the reply you got, it is clearly a proforma letter. I think the regional governor should look into this and respond adequately. Such negligence, and it is nothing but negligence, on the part of officials should be punished. As for your relative, as a veteran of the Great Patriotic War she is entitled to that flat. Incidentally, the number of people who had failed to join the waiting list before March 1, 2005 jumped after I made my announcement on television. There are 10,000 people on the waiting list already. But we will keep our promise in any case regardless of the number of people who have got the right to housing. Ernest Mackevicius: Maria, let’s take one more call. Vladimir Putin: And, I’m sorry but I would like to add that in many regions they put people on waiting lists in the relevant agencies, housing units and other departments of the municipal administrations. Maria Sittel: Mr Putin, let me explain why we picked this particular question: We have a lot of messages which quote the local authorities as saying: “We hear that Putin has promised it to you, so go and ask Putin.” We have got very many such questions that cite the reaction of the local administrations. Vladimir Putin: Well, if you have such facts, let me know while we are on the air and we will sort out the people who give such answers. Do we have any more questions? The Murmansk Region. You are on the line. Go ahead, please. Question: Good afternoon, my name is Lyudmila Viktorovna. The reports from the site of the Nevsky Express accident showed an old woman near whose house the tragedy occurred and we saw in what conditions that old woman lives. She had given all her blankets and clothes to the victims. And then there was a picture of hundreds of people standing in front of her fence which had fallen to the ground. I have a hunch that the track was mended, the workers went away and no one bothered to mend the old woman’s house and fence. I wish somebody could help her. Thank you. Vladimir Putin: Lyudmila Viktorovna, you have a kind heart, like that woman. Don’t worry, she will be all right. The president of Russian Railways reported to me that he had personally met her and her modest pension – I think it is just 4,500 rubles a month — will be doubled at the expense of Russian Railways and it will be for life. Her house will be restored. I had a conversation with the RZD president when he reported to me about that: They will move her closer to her family who live, as he told me, not far from the disaster site, in a small town. Everything will be all right, don’t worry. Thank you for drawing our attention to this fact. Ernest Mackevicius: Our broadcast continues, and our next point in today’s programme is Magnitka. My colleague Maria Morgun is hosting the show from the Magnitogorsk Metals Plant. Good afternoon, Maria. You have the floor. Maria Morgun: Good afternoon, Mr Putin, Ernest and all participants and viewers of our programme. We are indeed in Magnitogorsk, which is known as the capital of Russian ferrous metals industry. It has always been a single industry city and, by tradition, most of the local residents work here, at the plant or its branch enterprises. I would like to remind our audience that Magnitka is a major metal producer, accounting for more than 20% of the metal manufactured in Russia. Currently, we are in the workshop where steel plating goes through the final operation – zinc coating. Kilometres of steel sheet are then rolled into coils and sent to retail outlets. The unit next to which we are standing produces 2,000 tonnes of steel a day. Incidentally, it is in operation now. Magnitka, like any industrial centre, was hit by the crisis but tried to counter the blow. Still, workers at the plant have their problems and will speak about them. They have the floor. So, who has a question to ask? Please, members of the senior generation. Alexander Nikiforov: Good afternoon, Mr Putin. Alexander Nikiforov: I work in the coatings workshop. Here is my question. Mr Putin, you have often visited our legendary Magnitka and know our volumes of production. Now, however, we have to reduce them because there are no orders. Therefore, we need your help, assistance from the government, support – not for us, but for our main customers – the construction industry, the motor industry, the engineering industry. As soon as they receive orders, we will also receive them. And these mean work, wages and all the rest. There is also a second, smaller, question, Mr Putin. It is an open secret that Chinese metal and metal products – which are cheap but of very low quality – are now flooding the domestic market. We need to take some measures to ensure that Russian metal goes to Russia’s internal market. Thank you very much, Mr Putin. Vladimir Putin: Thank you for your question, Alexander. I feel you take the affairs of your plant to heart, especially when you speak about the quality of your products, which is higher than in imported items. I must say that I have been to Magnitka repeatedly and have seen how the plant is developing with my own eyes. I have some positive words to say to the management and shareholders. Mr Rashnikov is a good manager and not only because the company is developing and new technologies are being introduced, but also because a lot is being done to care for the people and to look after the environment. You know better than I do what winters used to be like in Magnitogorsk. Everything was black, including snow. Today, the situation is radically different. Perhaps, not all problems have been solved, but emissions to the atmosphere have changed cardinally and for the better. You are also adopting new technologies and opening new production setups. You mentioned the related industries and asked us to support them. But that is precisely what we have been doing. Next year we will direct the required resources to the construction industry, support mortgage schemes, and additionally allocate money for mortgage payments and reduction of mortgage rates down to 10 percent or 11 percent. As a first step, we will set aside 250 billion roubles for these purposes. We have preserved nearly all state construction programmes and even have expanded them in relation, say, to military personnel. We promised the military that in 2010 we would decide all issues connected with permanent housing. We will meet this goal no matter what, although, frankly speaking, it is a real challenge. But that also means support for builders. We promised to the railways that we would give them subsidies to purchase the equipment, rails and carriages they need. We will do this. And ultimately it means orders for you, as you rightly said. We will also support programmes connected with the motor industry. It is just wonderful that your plant is proving to be the leader and will turn out the best metal sheeting for motor vehicles. Across the world, there is only a couple of plants that guarantee such quality. I, therefore, have no doubt that you will not only cope with the current problems, but also show good results in the post-crisis period. Ernest Mackevicius: Mr Putin, there are very many questions arriving about our entry in the World Trade Organisation, future prospects, and the Jackson-Vanik amendment, which keeps being quashed, but is never quashed completely. Vladimir Putin: The Jackson-Vanik amendment was adopted back in the Soviet times. It was a U.S. response, a sort of economic sanction against the Soviet Union, which was restricting the emigration of Jews to Israel. As we all now understand, restrictions no longer exist, nor does the Soviet Union exist, but the amendment still survives. This is a telling anachronism, which different lobbying groups in U.S. Congress are trying to use to solve sufficiently narrow and branch-specific economic problems. They peg it to the need to increase poultry export quotas from the U.S., or they link it to some other issues. It is even opposed by those who suffered from such Soviet policy and served time in jails for anti-Soviet activity. They do not understand. They emigrated to Israel and made their political careers there. They cannot grasp why members of the American political establishment today tie up the Jackson-Vanik amendment with the current economic situation and with the solution of narrow selfish and branch-specific issues of an economic nature. But this is the reality. We have to accept it today. Now, concerning the WTO. Our entry remains our strategic objective, but our impression is that for some unknown motives certain countries, including the United States, are hindering our accession to the WTO. For us, our main priority is still integration across the post-Soviet space, and we are very pleased with the processes going on in the Customs Union, which I mentioned before, and which has been formed by Russia, Kazakhstan and Belarus. But following the organisation of the Customs Union, following its creation, a new quality has come into its own, and we will have to join the WTO through this Customs Union, or individually, but by conducting in-depth nuts and bolts consultations and agreeing all positions with our Customs Union partners. But this process will go on for us, for Kazakhstan, and for Belarus. Ernest Mackevicius: Maria, we can take one more question from Magnitogorsk. Maria Morgun: Yes, of course, we have enough questions. Now, who wants to ask a question? Please, go ahead. Natalia Asatryan: Good afternoon, Mr Putin. I am an engineer in the coatings workshop. The other day I was taken to our City Hospital # 1 and, honestly, I was shocked by the conditions I found there. You just cannot imagine what it all looks like. The hospital was built in the early 1930s and has not been repaired since then. The hospital is a shambles. It was never renovated and all sinks are covered with rust, there is not even a shower room for patients to wash. They have to go home to take a shower. But there are too many patients from villages who simply cannot travel back to take a bath. A similar situation is with medical equipment which the doctors have to use. Everything is badly outdated. The same state of things exists in our other hospitals and polyclinics, which all need repairing. There are long queues in the hospitals. Pregnant women have to spend four to five hours waiting in reception. Occasionally, they are examined in the corridor, which is simply unacceptable. We know about the National Healthcare Project, which is making good progress, and we know about the construction of large specialised medical centres. But the question I want to ask is this: Are there any plans to repair or perhaps build new hospitals in such small towns as ours? Vladimir Putin: Natasha, we are really doing a great deal for health services, especially in primary care. As you know, several years ago we massively increased the salaries, on the scale of those days, and allocated considerable resources for the improvement and renovation of facilities. We did so at the federal level to maintain primary care, although that is, legally and actually, the concern of the regions and municipalities. And in many parts of the country we see positive processes going on in the renewal of fixed assets in health services. If the situation in Magnitka is different, I am sorry. Today a great concern for us is the flu. In Magnitka, and generally in the Chelyabinsk Region, the epidemic is now over 30% above its threshold value, according to information available to me. This means the hospitals and polyclinics are overcrowded. That, unfortunately, is a fact and nothing can be done about it. In many regions, municipal medical institutions are introducing overtime for doctors and increasing their numbers for this period of time. If that has not been done in your case, it is a pity. This must be done, the flu epidemic must be dealt with promptly. But the question of renewing fixed assets and purchasing new equipment is, of course, a long-term matter which must be addressed promptly. I can only tell you that I will certainly discuss the situation with the governor and then we will see. If some help is needed from the federal government, we need to understand what kind of help is needed, and no doubt the region itself, the Chelyabinsk Region, should take the initiative and be the first to take early steps. I repeat: I will certainly speak with the governor. Your governor is an experienced and respected person, and generally an effective manager. We will see what we can do for Magnitka. Ernest Mackevicius: Thanks a lot to Magnitka. Now we will continue this discussion here in Moscow. Farida Kurbangaleyeva is signaling to me that someone wishes to speak on this issue.